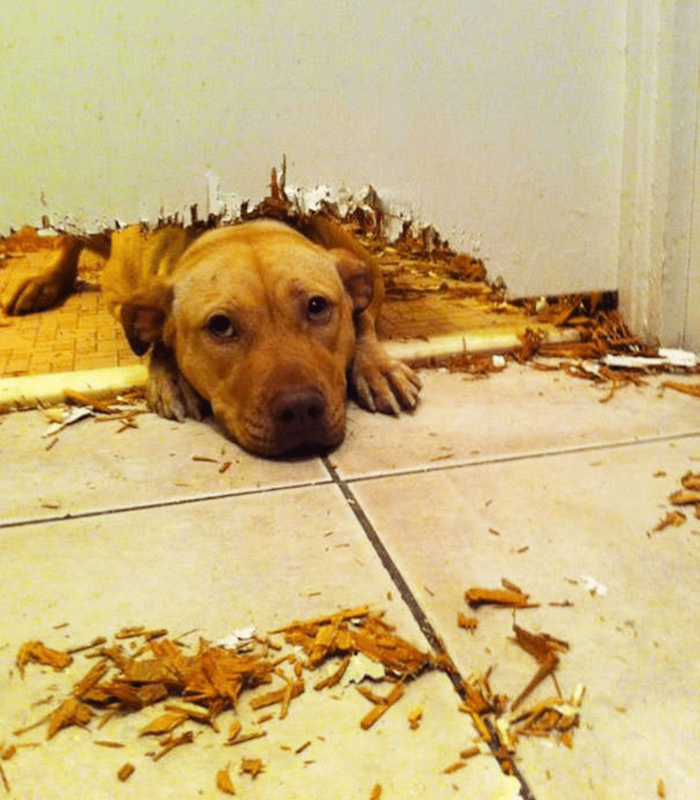 As any dog lover knows, our four-legged friends can certainly get themselves into a little mischief now and then. Whether it’s eating foods they aren’t supposed to, terrorizing the cat, or even tearing up furniture; it’s the price you sometimes have to pay if you share your life with a dog. 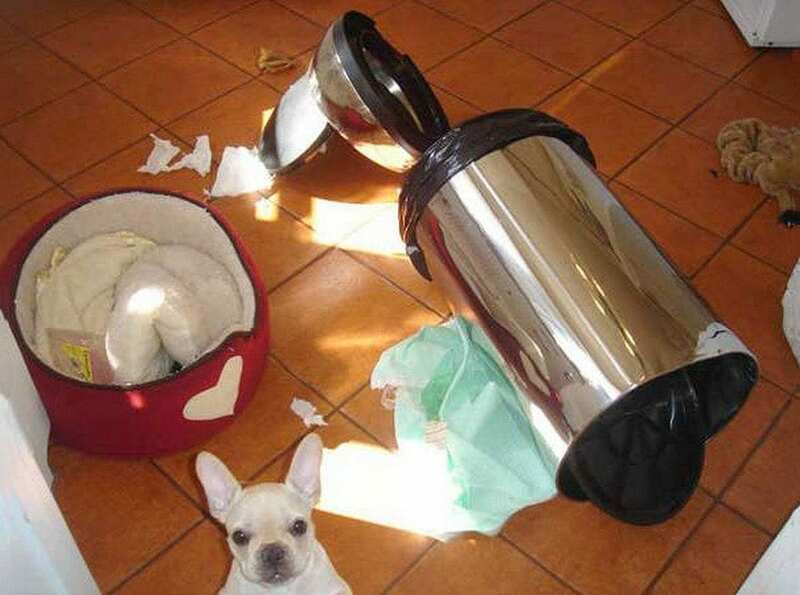 Let’s check out some of the most notorious dogs that have been caught in the act of doing something they shouldn’t. Try not to laugh! 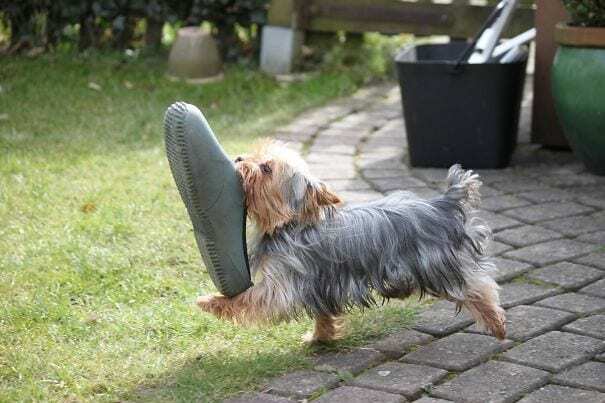 Dogs will often eat anything they can get their snout in. 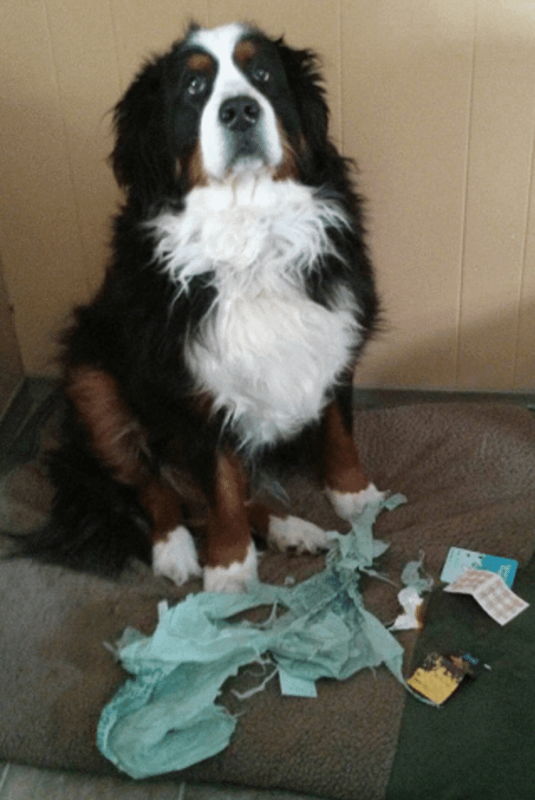 This pup certainly appears to have enjoyed himself until he was so rudely interrupted! He makes a mad dash to hide the evidence, but the proof remains in plain sight. 2) I just needed to see you. 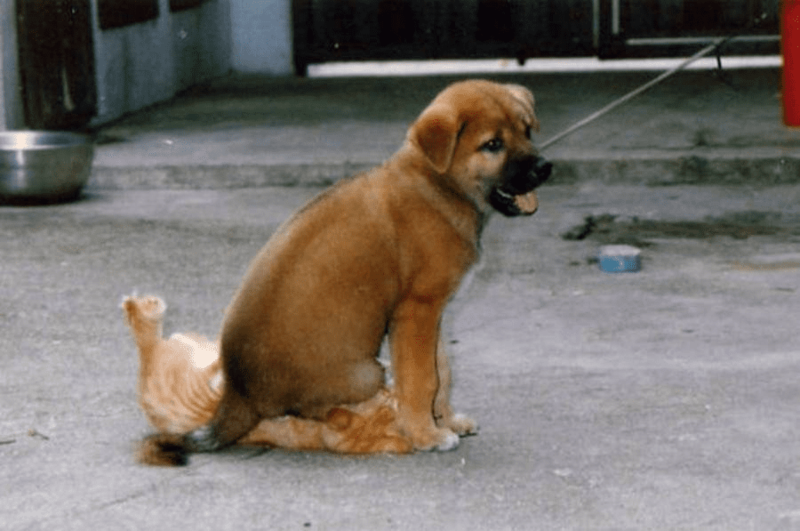 Some dogs just really can’t stand to be away from their owner for any period of time. Pups are incredibly resourceful. If a wall stands in their way, they have absolutely no qualms about removing it. Case and point. 3) It looked better on the hanger. We’ve all been there. 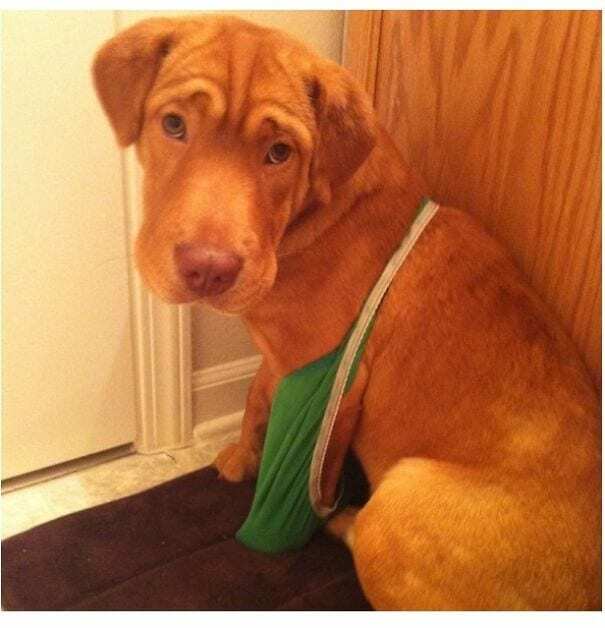 You can’t help but sympathize with this dog’s sadness over this garment not fitting exactly how she thought it would. She could probably use a hug right about now! 4) When subtlety isn’t really your thing. 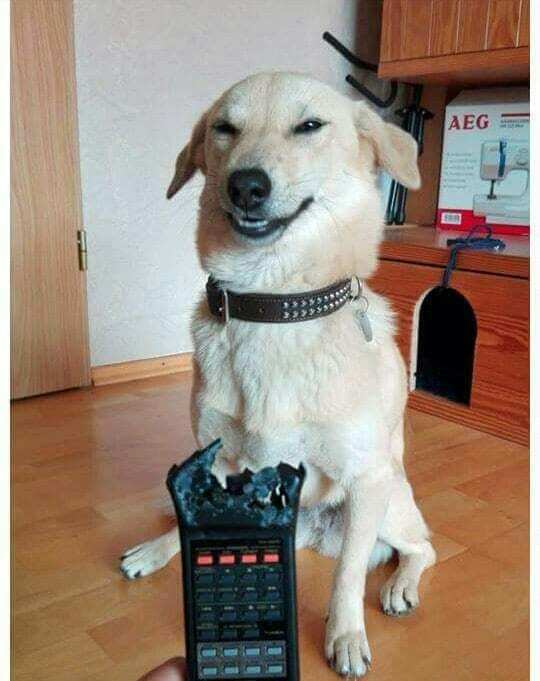 This pup looks pretty pleased that he was able to get away with snagging a shoe. The problem? It’s as big as he is! He definitely gets an ‘A’ for effort, though! 5) It wasn’t even worth it! 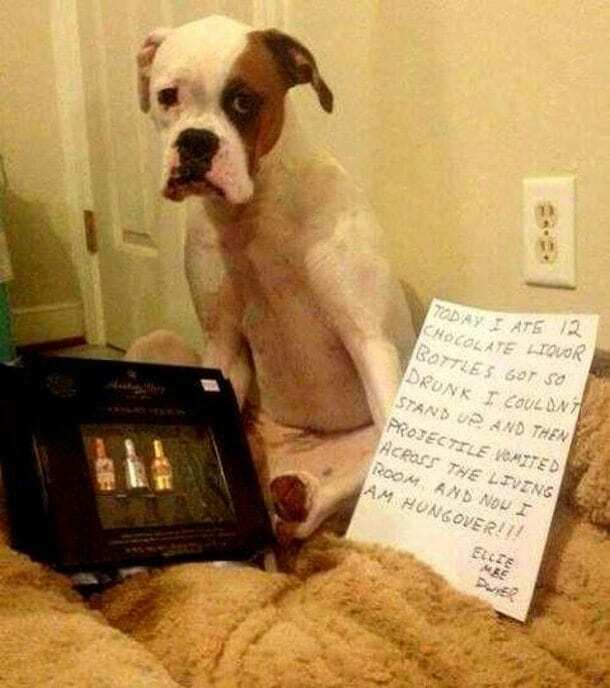 I can’t tell if this dog is sad he got caught or upset that it wasn’t even worth it! 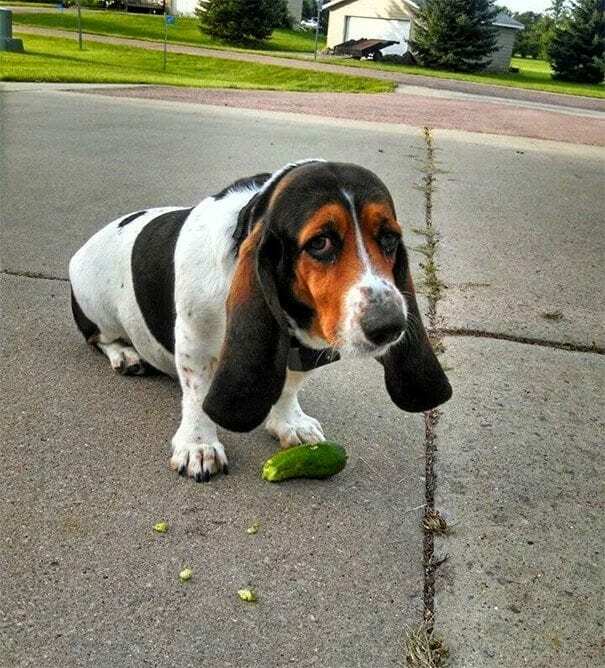 It looks like he took a couple of bites of this cucumber and immediately regretted his life decisions. 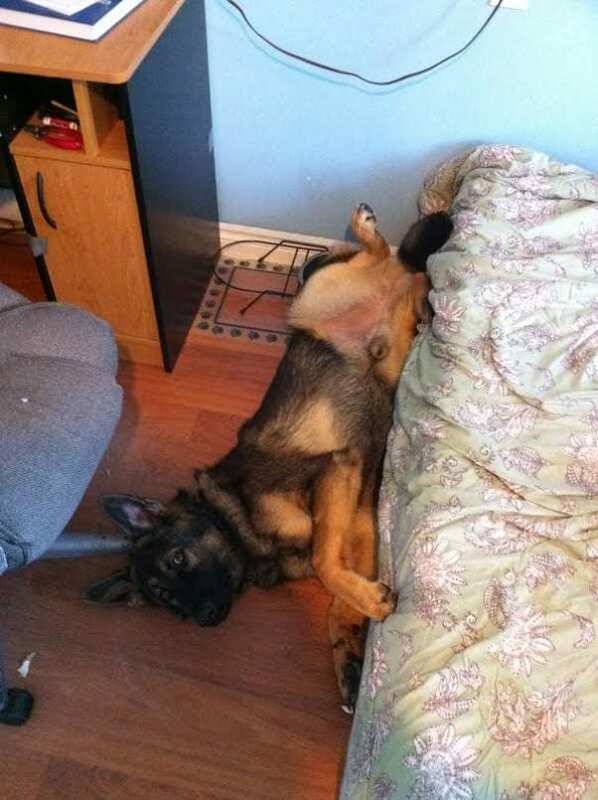 When this pup was caught on his owner’s bed, he rolled off and tried to act casual. Just act confident and everything is fine, right? 7) I can’t see you, so you can’t see this! It’s a good strategy little guy, if only it worked! 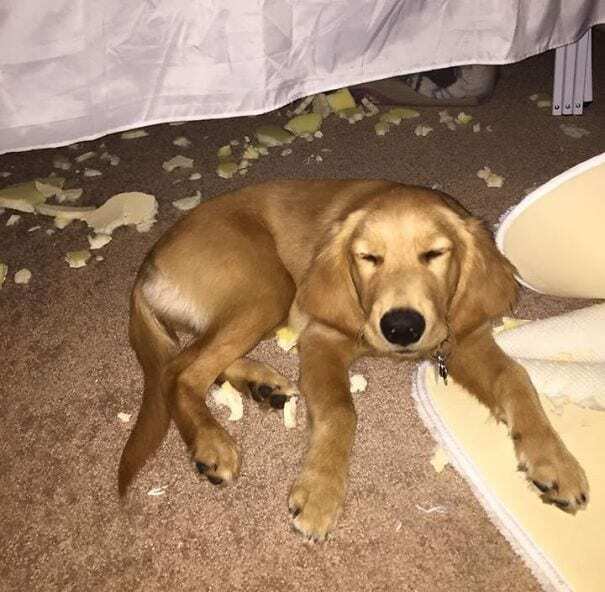 This pooch believes if he closes his eyes then maybe his owner won’t notice the destruction behind him. Nice try, buddy! 8) Just a little closer. At first glance, this doesn’t seem too mischievous. However, the owner claims that the dog is only pretending to sleep so he can inch closer and closer to that coffee cup. 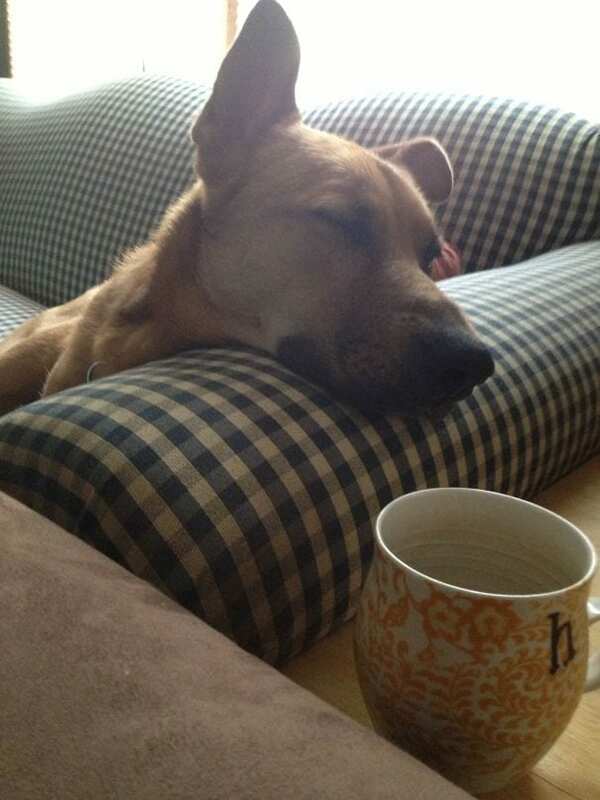 Apparently, even dogs can’t resist a cup of Joe first thing in the morning! This dog looks like he’s ready to do a little shopping! 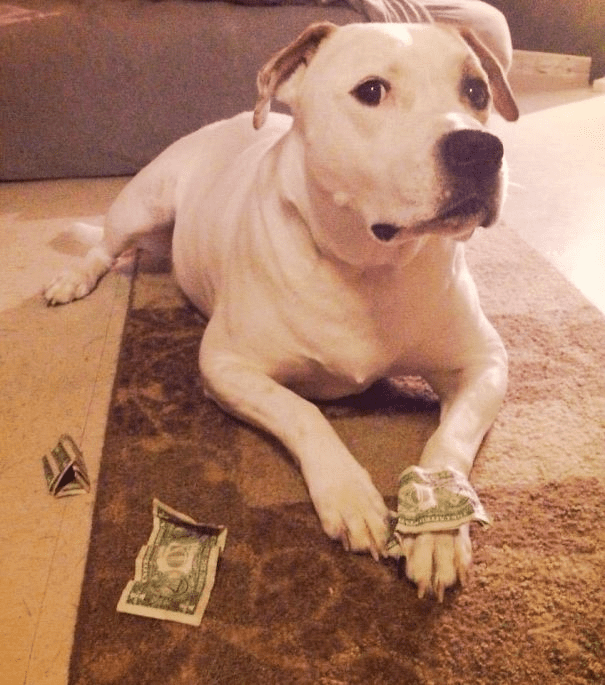 It appears he knows that money is too valuable to rip to shreds, and for that, the owner should be forever grateful. 10) It was all the cat. These two appear to be up to no good, but the dog is more than willing to turn on those sad puppy dog eyes to sell out his feline friend. 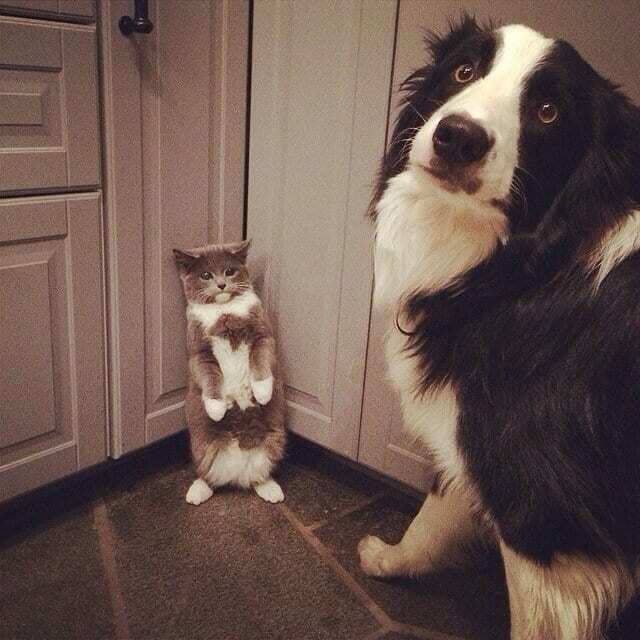 Who do you think is the guilty one? It’s a mystery! 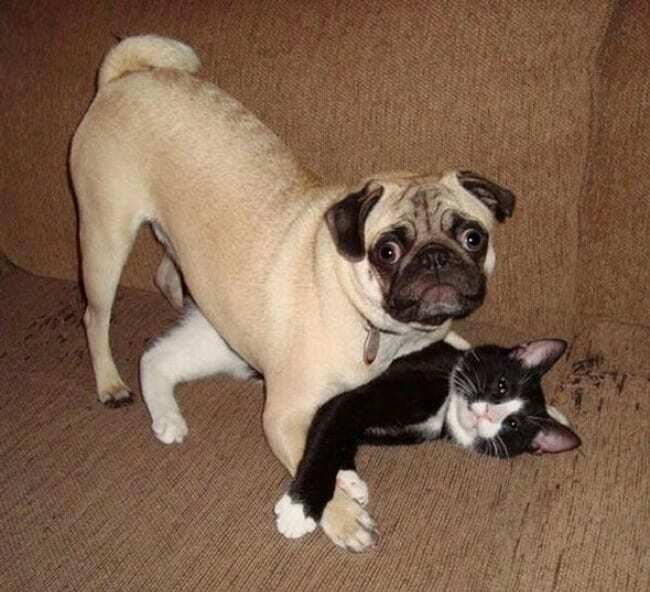 11) This isn’t what it looks like! 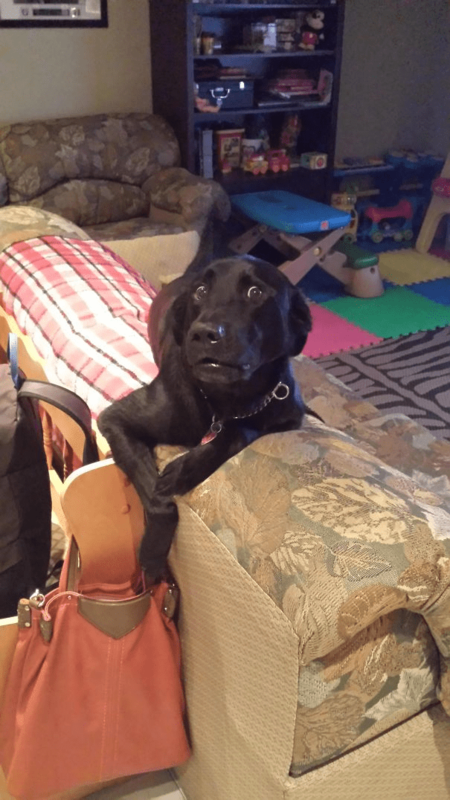 Don’t you hate when your paw ends up in someone else’s purse? Yeah. So does this dog. 12) It was attacking me, I swear. Look at his adorable eyes! 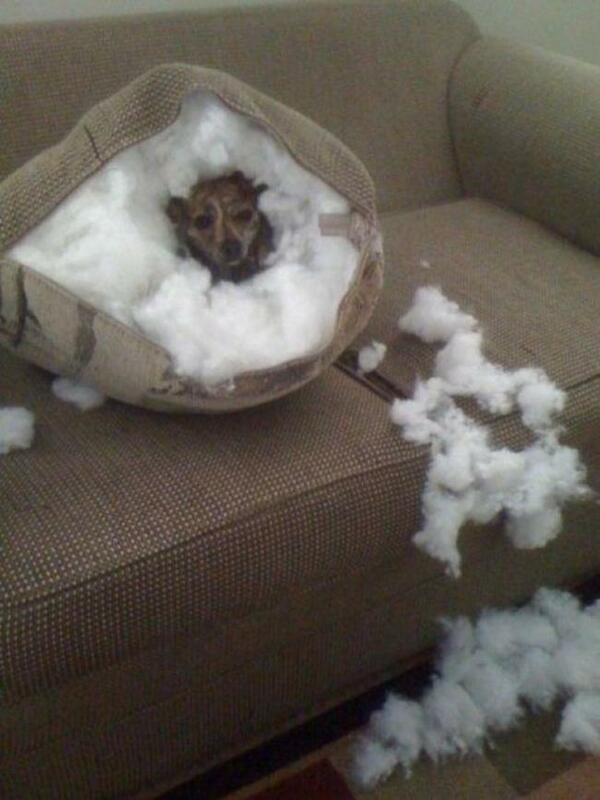 It’s apparent this dog really regrets tearing up….whatever this used to be. 13) Nothing to see here. This dog looks like if he plays it cool nobody will notice the cat trapped underneath him. Who knows, maybe the kitty sat in his favorite spot. 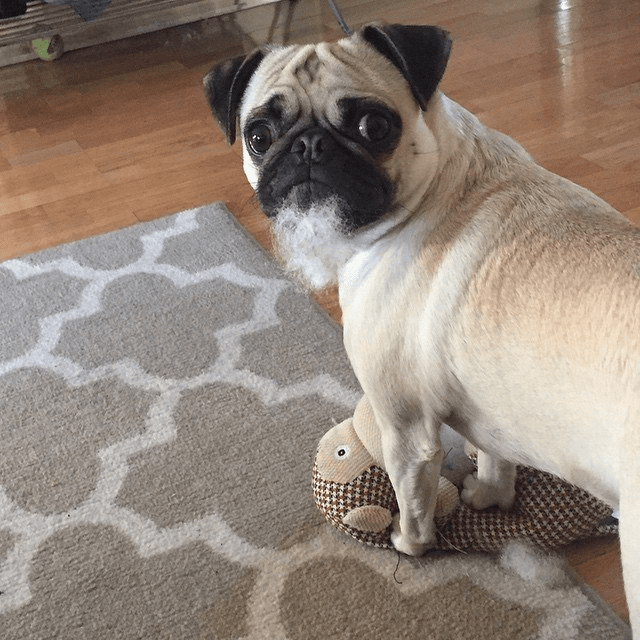 14) What is this squeak toy you speak of? Hey pup, when you were violently tearing that stuffed animal apart, you forgot a spot on your chin! 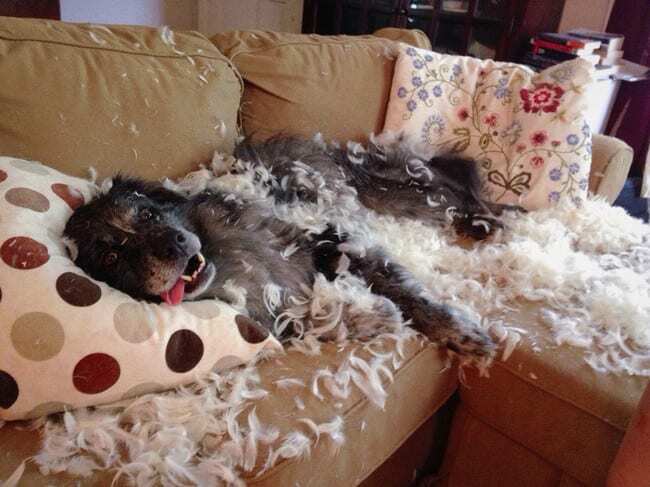 This dog must have really been going at it to totally rip the stuffing right out of it. On a different note, he looks really cute with a beard! 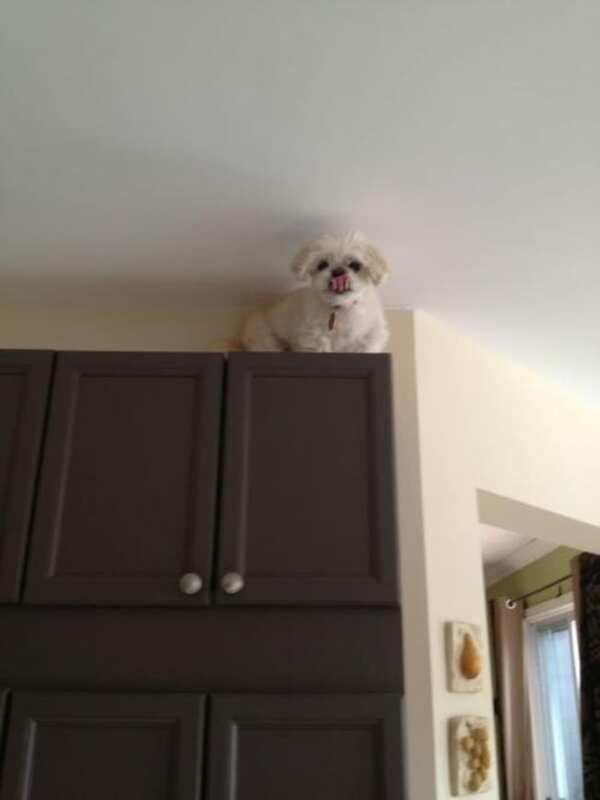 Dogs aren’t exactly picky when it comes to where they hang out. 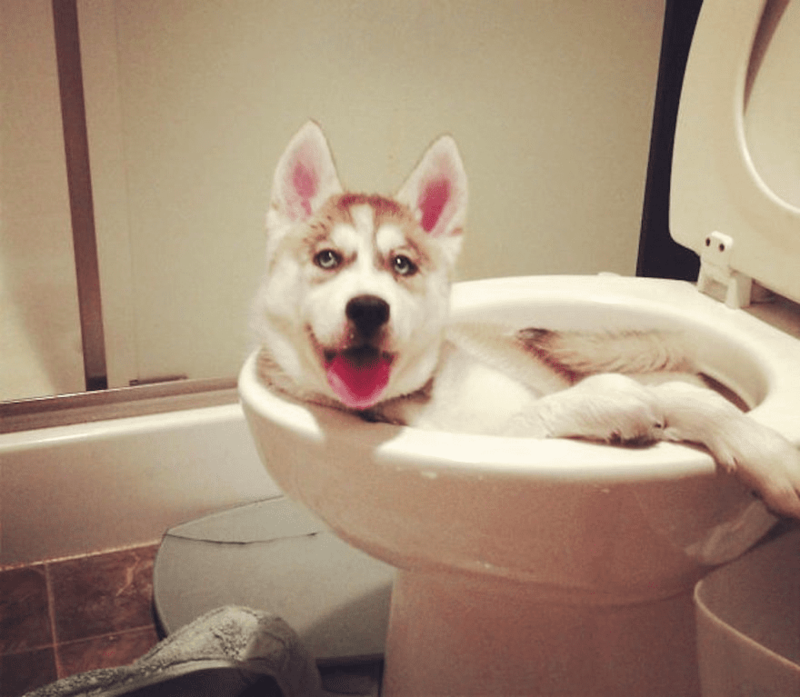 This pup is perfectly content laying around in the cool toilet bowl. It looks like it was made for him! 16) Sometimes karma is the best punishment. 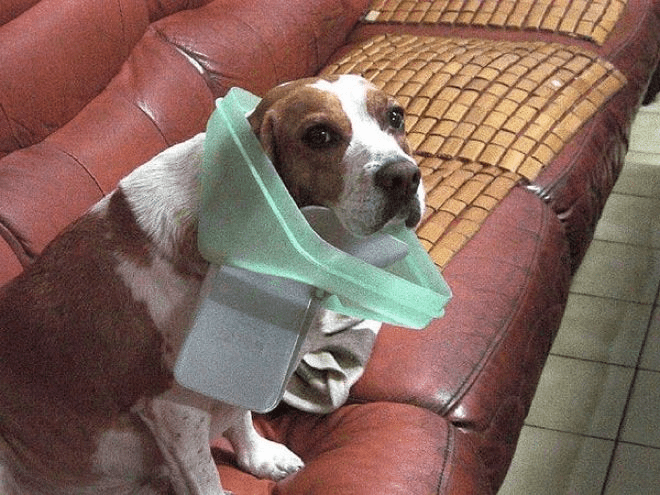 This pup was obviously getting into the garbage when his head got stuck in the trash can lid. Not only is it hilarious, but probably a punishment in itself. He’ll likely not be doing THAT again. 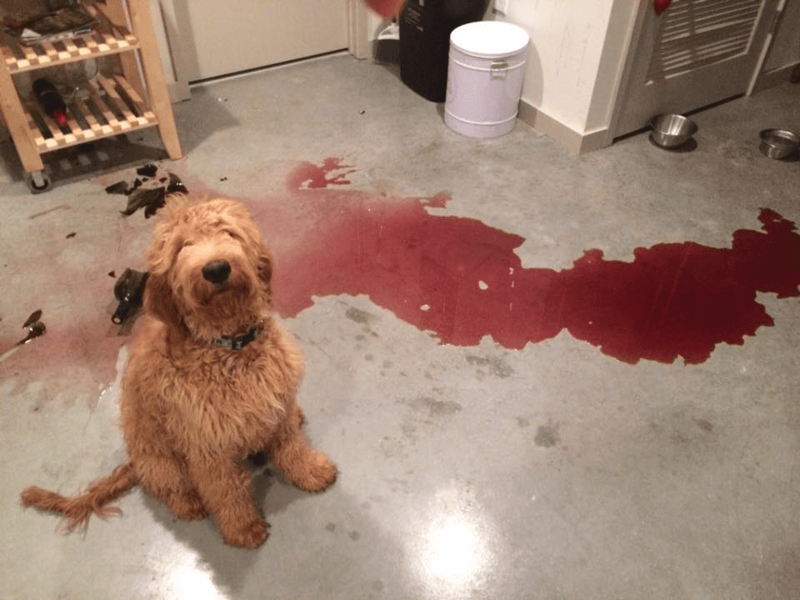 For all the wine lovers out there, can we really blame this pooch for getting into it? Maybe he had a really hard day and needed to unwind. 18) This probably wasn’t important, right? One look at those big, brown eyes and anybody would forgive this pooch for his wrong-doing. He’s sorry. Really. He’ll never rip up another thing. Promise. 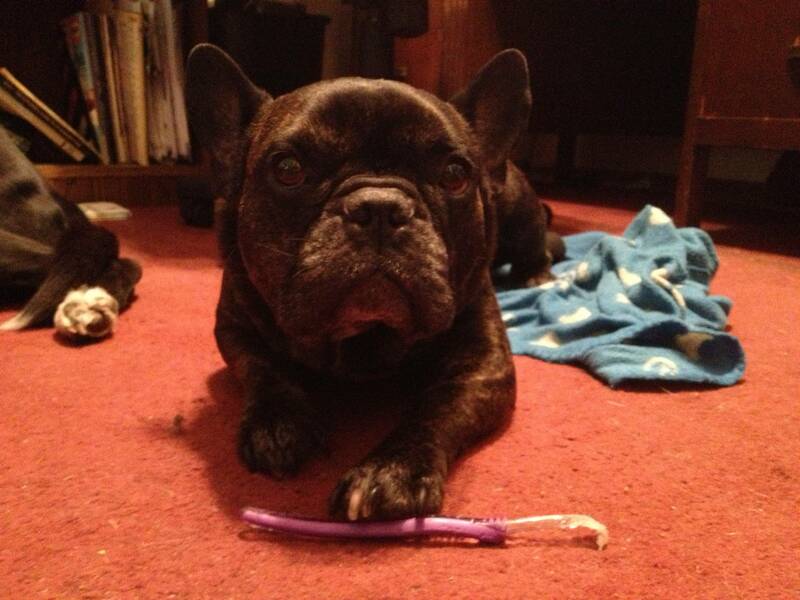 19)Even dogs respect dental hygiene. Perhaps we should give this pup the benefit of the doubt. 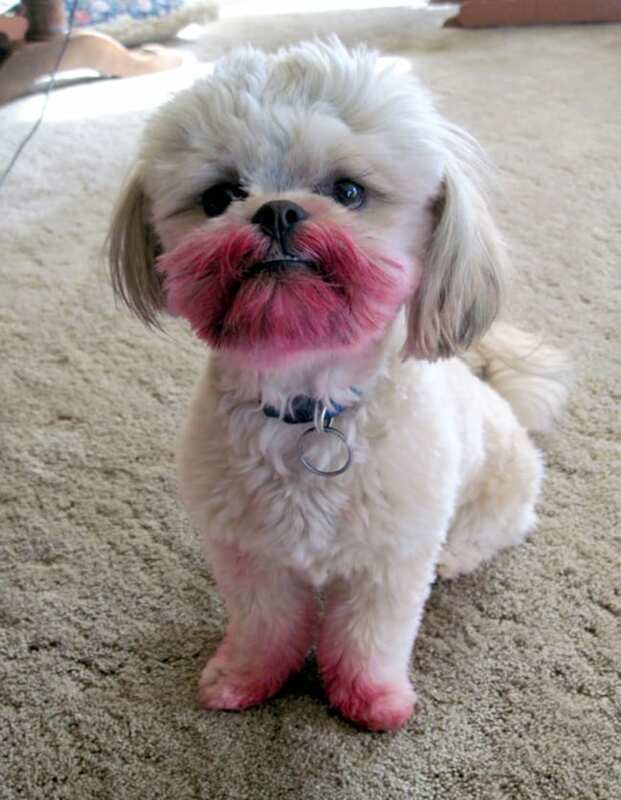 He may have been brushing his canines when things got a little out of hand! 20) I saved one for you. This dog appears to be more confused about why his owner isn’t joining in on the fun! He’s perfectly content resting up on the bed and knowing at his favorite pillow. What more could you ask for? 21) 1, 2, 3—Ding, Ding, Ding! Look at this playful pup! 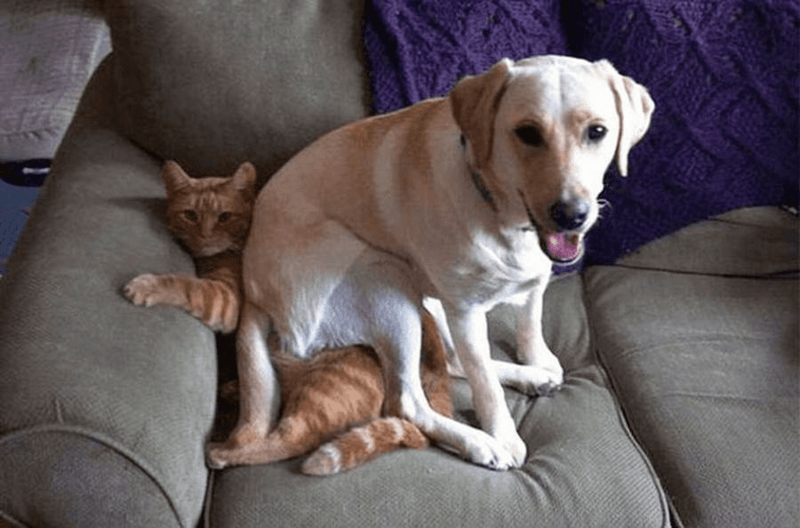 He seems to be having the time of his life sitting on top of his feline pal. This wrestling match clearly has a winner. 22) There’s a totally logical explanation. 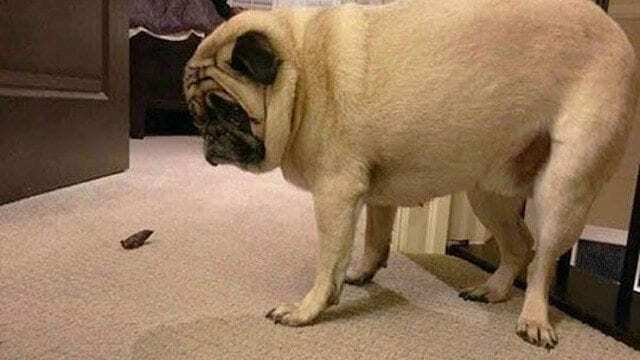 This dog seems to really be in a pickle! 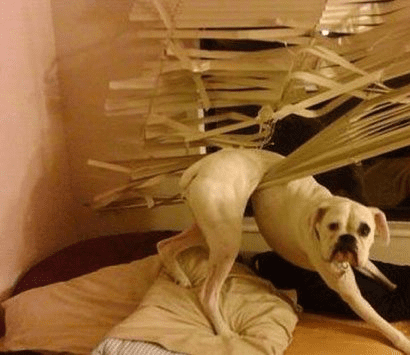 Blinds can certainly be tricky and this pup found out the hard way that they sometimes fight back. 23) Every bad decision begins with a night like this. This dog has quite the story to tell! Maybe a day of feeling like death will teach him a very valuable life lesson. 24) This could probably belong to anybody. Look at that sad little puppy face! Even if he was trying to blame it on someone else, those eyes tell the real story. 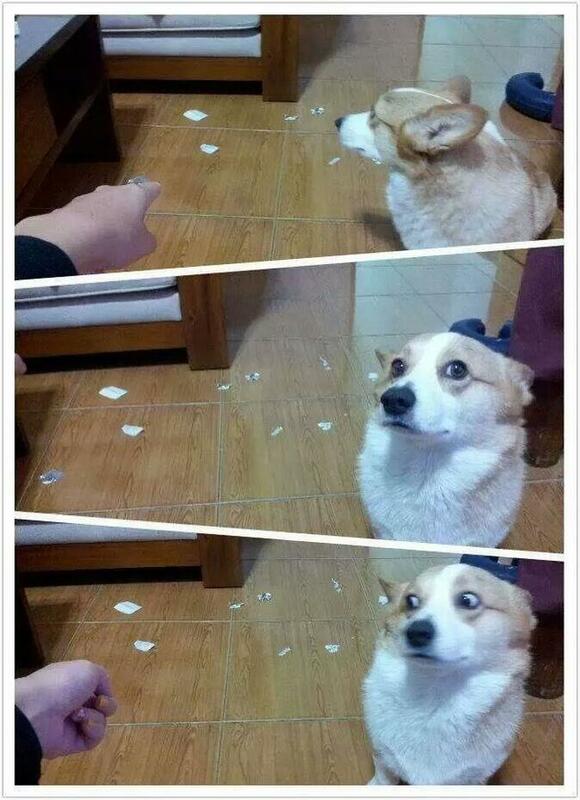 This dog isn’t acting like he’s innocent, he’s just saying you’ll PROBABLY get over it. Look at that little grin! Check out this adorableness! 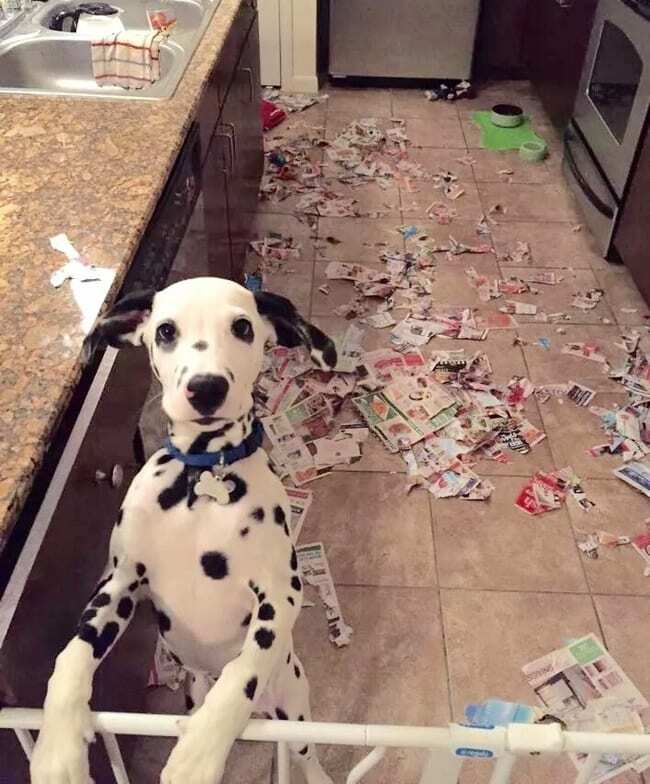 This puppy looks like he’s just trying to convince his owner that it wasn’t him. It’s almost tempting to believe him. 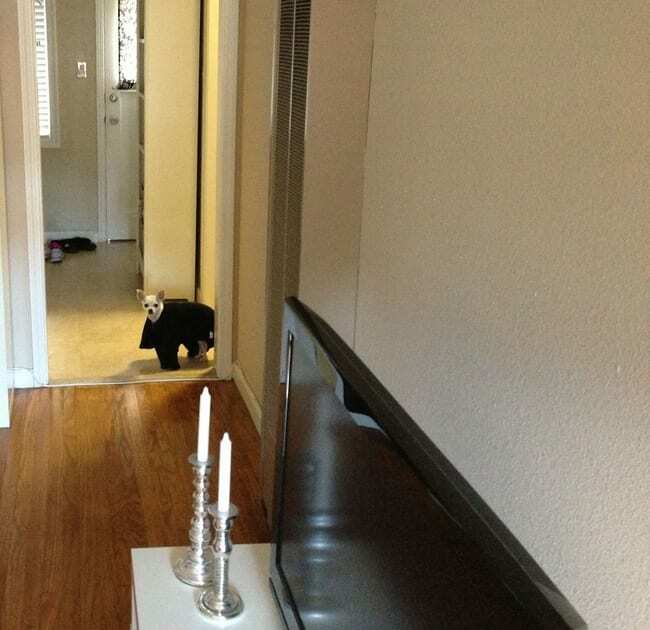 It appears this dog wasn’t expecting to see his owner home so soon. It also looks like he hadn’t quite got to polish off that slab of meat he tore open, either. 28) But it’s so cozy! 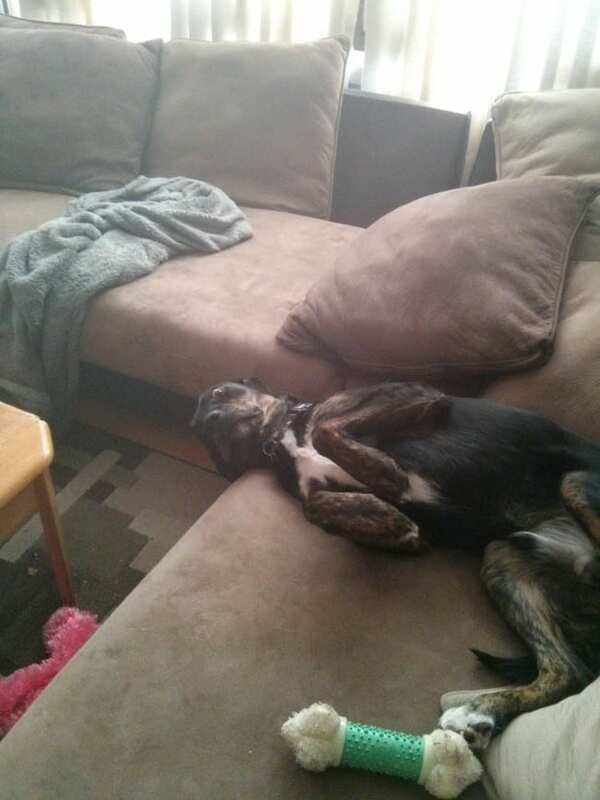 You can’t help but admit that this dog looks absolutely comfy. 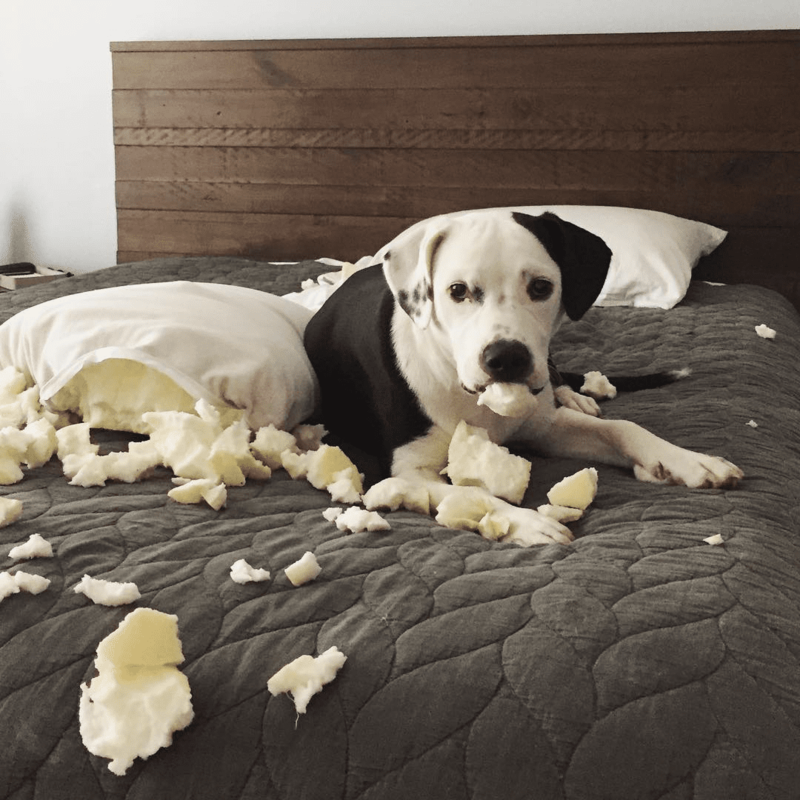 Can we really blame him for ripping this pillow up? It’s like a cozy little dog hut. 29) I have no idea what you are talking about. This little fella appears to have gotten into some berries, but of course, there’s no proof of that! He looks absolutely adorable. 30) A little help, please? Whatever adventures this pup has been on has landed him on some pretty high ground. 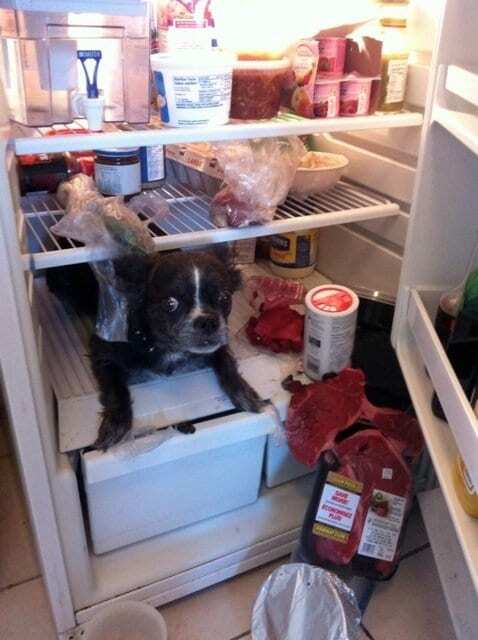 It’s so funny to see where a dog’s shenanigans takes them. 31) This is a disaster! Wow, this is quite the mess. It’s impossible to stay upset with those cute puppy eyes peering up at you, though. 32) Doesn’t he look happy? 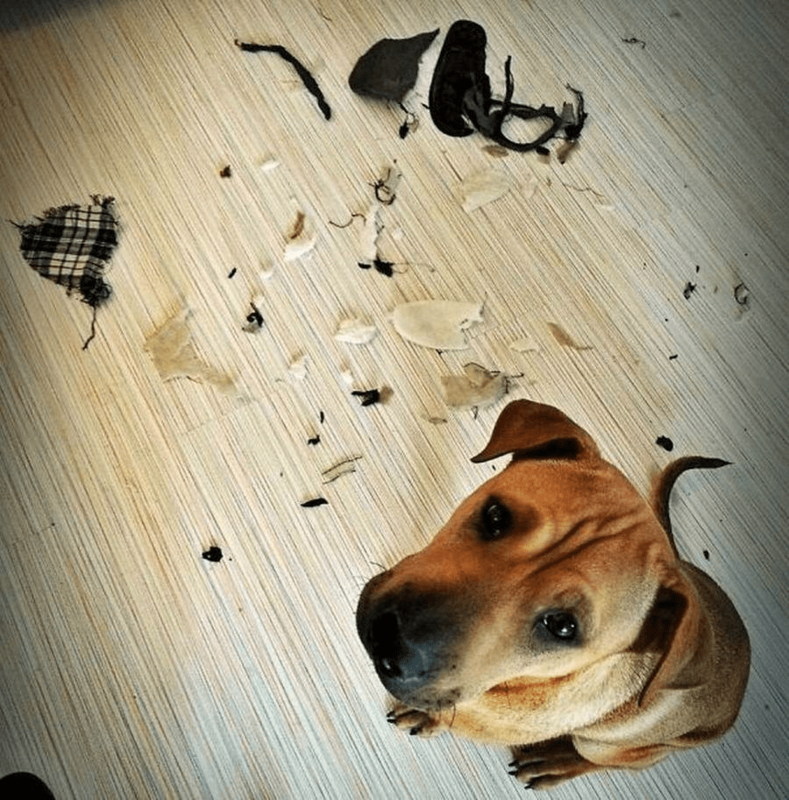 Nothing brings joy to a dog quite like ripping something to pieces. That puppy grin says it all. 33) Oh…that? Yeah, I have no idea. This dog is determined to pretend like he has no idea what his owner is talking about. That mess? Never seen it before in my life. Yeah. Right. This dog is trying to convince his owner that there’s no funny business going on. The cat’s fact says a different story! Heeelp Meee! 35) Just wanted to see how it fit. Hey, sometimes you have to try it on to know for sure. This pup is simply testing out his fashion sense. Nothing to see here! 36) Just pretend to be a statue. 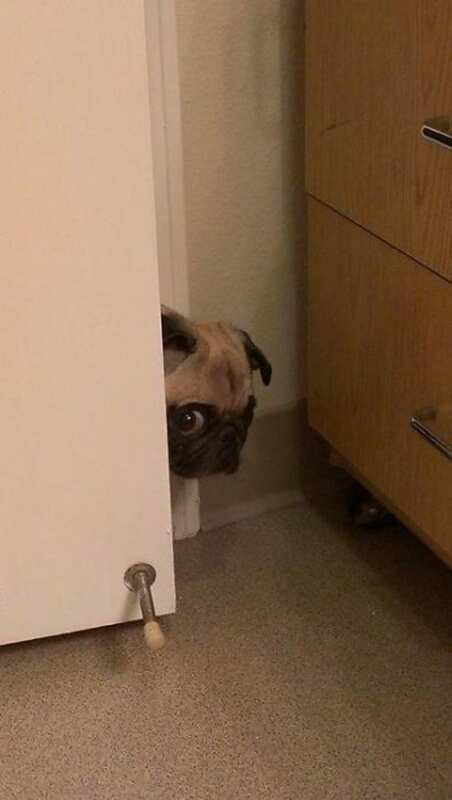 This dog’s owner came home early. Instead of finding his dog on full alert, he simply found his dog with a startled face and sitting stone still. Maybe a watch dog isn’t exactly his calling? 37) I’m not sure why you don’t believe me! 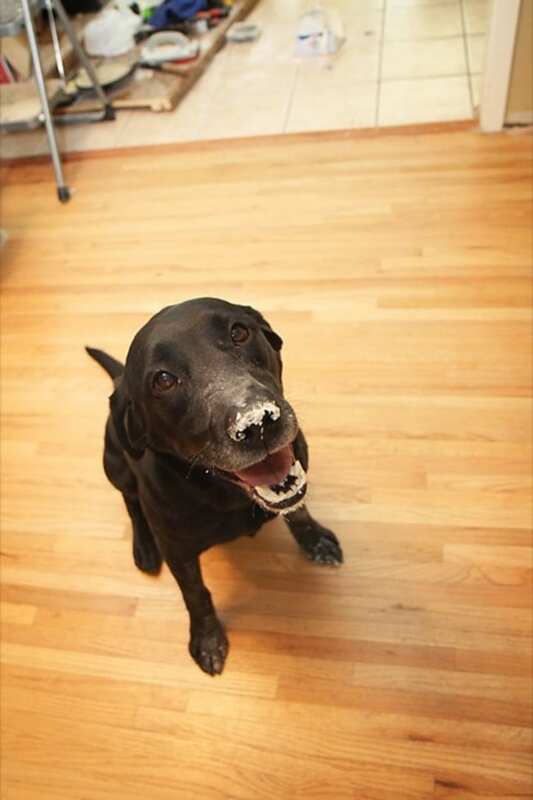 It’s so funny when a dog doesn’t realize all the evidence is on their face! He doesn’t have a care in the world! 38) Listen, you don’t want to see what’s behind this door. 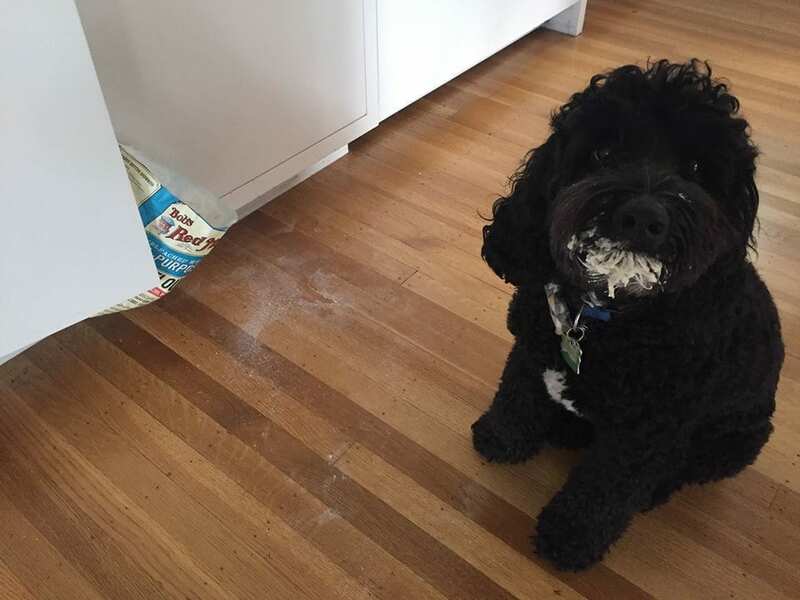 It’s not clear what this dog has been up to, but his face suggests it might be some trouble! He may be cute, but he sure looks guilty.